Most on Wall Street were bullish on bank stocks a year ago but back then I warned investors not to be. This week earnings from super regional banks BB&T Corp. (BBT - Get Report) , M&T Bank Corp. (MTB - Get Report) , PNC Financial Services Group Inc. (PNC - Get Report) , SunTrust Banks Inc. (STI - Get Report) and U.S. Bancorp (USB - Get Report) will set the stage for 2019. All five have solid gains off their Christmas lows but are also still in bear market or correction territory since setting their 2018 highs between January 2018 and July 2018. Wall Street analysts recommended bank stocks given the "text book" notion that banks always benefit from rate hikes by the Federal Reserve. This strategy began to fail as the super-regional banks began setting highs in January beginning with U.S. Bancorp. My theme has been and continues to be that as the Federal Reserve unwinds its balance sheet, money is drained from the banking system, which hurts bank liquidity. In 2019, Federal Reserve policy will be more focused on the unwinding of their huge balance sheet not on rate hikes. I predict two rate hikes in 2019, one in June and one in December, which will bring the federal funds rate to a "neutral" 2.75% to 3.00%. The main tool the Fed will be using is the unwinding of the balance sheet. As of Jan. 9, the balance sheet was marked at $4.056 trillion down $444 billion since October 2017 when it was $4.5 trillion. The first drain of 2019 was just $2 billion, and this will likely grow to between $30 billion and $50 billion in January, given the number of U.S. treasuries that mature on Jan. 15 and Jan. 31. The monthly unwind will likely be $30 billion to $50 billion as treasuries mature. BB&T Corp. set its 2018 high of $56.31 on March 12 and set its 2018 low of $40.68 on Dec. 26. The stock is in correction territory 19% below the high and is 12.1% above the low. The bank has a P/E ratio of 11.85 and a dividend yield of 3.55% and reports earnings Jan. 17 with expected earnings of $1.05 per share. 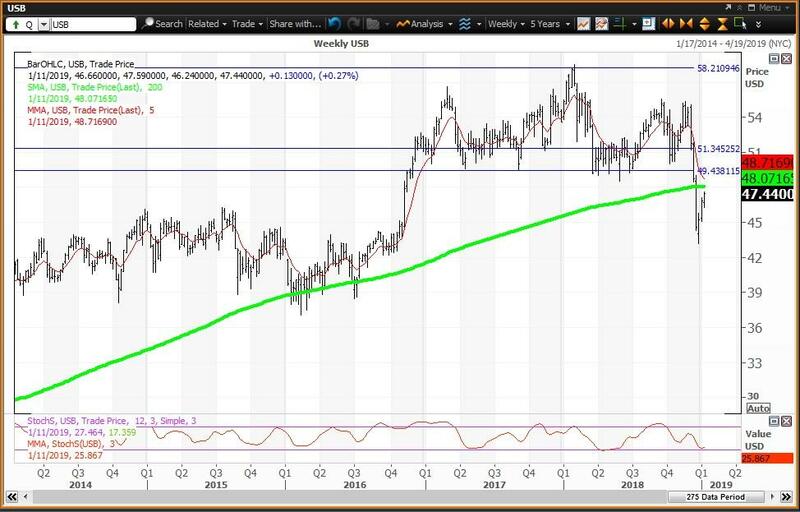 The weekly chart will be positive if the stock ends this week above its five-week modified moving average at $46.20. The stock is also above its 200-week simple moving average or "reversion to the mean" at $43.54. The 12x3x3 weekly slow stochastic reading ended last week at 28.43, up from 25.47 Jan. 4. Buy weakness to my monthly value at $45.17 and its "reversion to the mean" at $43.54 and reduce holdings on strength to my quarterly, semiannual and annual risky levels at $47.30, $48.42 and $51.83, respectively. M&T Bank set its 2018 high of $197.37 on Feb. 27 and set its 2018 low of $133.78 on Dec. 26. The stock is in bear market territory 23.6% below the high and is up 12.7% above the low. The bank has a P/E ratio of 12.11 and a dividend yield of 2.65% and reports earnings on Jan. 17 with expected earnings of $3.49 per share. The chart will be positive if the stock ends this week above its five-week modified moving average at $152.43. The stock is also above its 200-week simple moving average or "reversion to the mean" at $145.62. The 12x3x3 weekly slow stochastic reading ended last week at 25.51 up from 20.81 on Jan. 4. Buy weakness to my monthly value at $146.16 and its "reversion to the mean" at $145.62 and reduce holdings on strength to my semiannual, quarterly and annual risky levels at $165.52, $166.69 and $168.89, respectively. PNC Financial set its 2018 high of $163.58 on Feb. 27 and set its 2018 low of $108.45 on Dec. 26. The stock is in bear market territory 26.6% below the high and is up 10.7% above the low. The bank has a P/E ratio of 11.70 and a dividend yield of 3.17% and reports on Jan. 16 with expected earnings of $2.78 a share. 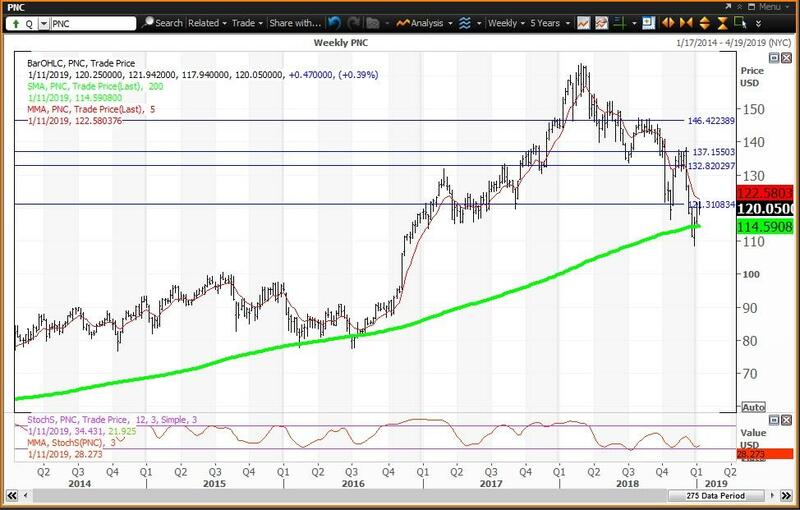 The weekly chart will be positive if the stock ends above its five-week modified moving average at $122.58. The stock is also above its 200-week simple moving average or "reversion to the mean" at $114.59. The 12x3x3 weekly slow stochastic reading ended last week at 28.27 up from 25.19 on Jan. 4. Buy weakness to its "reversion to the mean" at $114.59 and reduce holdings on strength to my annual, semiannual and quarterly risky levels at $133.76, $137.08 and $145.38, respectively. SunTrust set its 2018 high of $73.44 on July 24 and set its 2018 low of $46.05 on Dec. 26. The stock is in bear market territory 23.1% below the high and is up 21.1% above the low. The bank has a P/E ratio of 10.54 and a dividend yield of 3.59% and reports earnings on Jan. 18 with expected earnings of $1.40 a share. The weekly chart will be positive if the stock ends above its five-week modified moving average at $55.74. The stock is also above its 200-week simple moving average or "reversion to the mean" at $52.84. The 12x3x3 weekly slow stochastic reading ended last week at 21.45 up from 13.35 on Jan. 4. 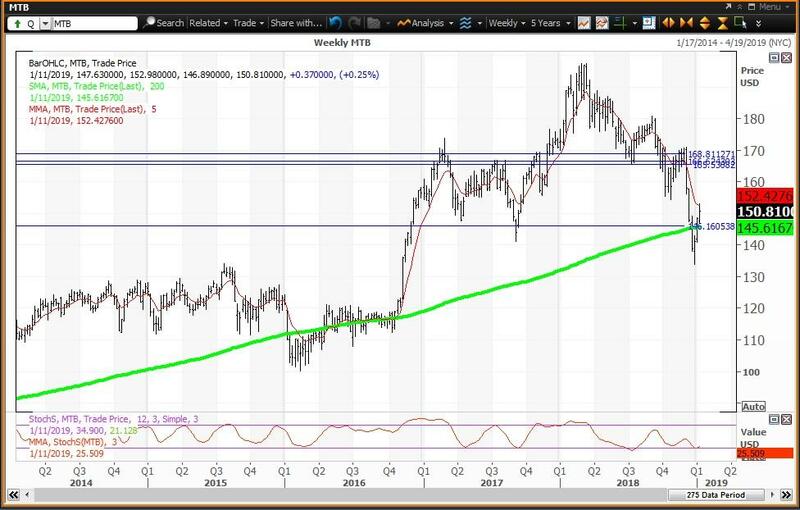 Buy weakness to its "reversion to the mean" at $52.84 and reduce holdings on strength to my monthly, semiannual and quarterly risky levels at $60.35, $62.54 and $64.73, respectively. My annual pivot is $56.69. U.S. Bancorp set its 2018 high of $58.50 on Jan. 29 and set its 2018 low of $43.14 on Dec. 26. The stock is in correction territory, 18.9% below the high, and is up 10% above the low. The bank has a P/E ratio of 12.13 and a dividend yield of 3.12% and reports earnings on Jan. 16 with expected earnings of $1.06 per share. The weekly chart will be positive if the stock ends this week above its five-week modified moving average at $48.72. The stock is below its 200-week simple moving average or "reversion to the mean" at $48.07. The 12x3x3 weekly slow stochastic reading ended last week at 25.87 up from 25.07 on Jan. 4. Buy if the stock closes above its "reversion to the mean" at $48.07 and reduce holdings on strength to my semiannual, quarterly and monthly risky levels at $49.43, $49.81 and $51.34, respectively. My annual risky level is $58.22.